Now she has precisely six seconds until she hits the water below her—just six more seconds until she is finally freed from her mundane and aimless existence. Freed of all of the regrets and disappointments that have haunted her throughout her nineteen years. She just needs to be free. I know that we all like to pretend we don’t base our opinions on looks—but come on. We all know deep down that looks are incredibly important—ESPECIALLY for books. The cliché “don’t judge a book by its cover” couldn’t be more wrong. As humans, we are drawn to things that are visually appealing—it’s our natural instinct. Therefore, if we have a choice between five books, without knowing a single thing about the author nor the subject matter—what’s the first thing we’re going to be drawn to? Images (with titles right behind, of course). A strong, beautiful image can make or break a book. A strong image can make people think, can make people curious, and make people want to know more. Your book NEEDS a strong image if you’re going to be successful. If you’re aiming at or in the process of being traditionally published, make sure to have your voice heard as much as possible when it comes to making that fateful decision. That is, if you have that opportunity. I’ve read several stories of Big 6 authors who had zero say over what the editors picked and absolutely hated the final product. To me, that’s got to be painful—seeing, quite often, your life’s work presented to the world in a distasteful package. But let’s hope you do get a voice. Be sure to share your opinions to anyone and everyone who’s willing to listen—don’t chance it by leaving it totally up to them. If you’re going to publish yourself, you get all the control. And honestly, that’s one of my favorite things about being an indie author. I love art and I love the opportunity to connect a piece of art to my own story. So when you set out to get your own cover, have a rough idea of an image in mind. Find a fantastic graphic artist who can help you bring that image to life (I know that self-publishing can get expensive, but this is not the time to count pennies. Spend as much money as you can to get the greatest artist you can. It is worth every cent). Make sure it’s what you want—it’s your own hard-earned money out of your own pocket, so don’t be afraid to speak up if changes need to be made. If you’re stuck for an image idea, think of a pivotal moment in your character’s journey that could be depicted on the cover. Or maybe even a special symbol or location. Just be sure it’s something that matters. There are far too many headless girls or girls in random pretty dresses donning the covers of the YA world these days. Do something that stands out. Do something provocative. Do something that makes people have to read your book. Whatever you do, don’t hold back your creative intuition. Your story is worth all of it. I think deep down, I’ve always known it was going to end this way. I was never meant to live a long life. I accepted this fate a long time ago. I was just waiting for the right moment. I wanted to fall in love first. I wanted to experience what it was like to have a real family first. I wanted to know what it was like to be sincerely happy, even if it was short-lived. I got all of those firsts. And now I’m ready to move forward. I inch my feet closer to the open sky. And closer. Until my naked toes are peeking over the edge. The water cracks violently below me, begging for me to join in on all of the fun. Just a few more seconds before it’s all over. I’m totally relaxed. This moment, it’s all mine. No one can take it away from me. I close my eyes. The sounds of high heels clicking on the walkway and cameras snapping and preserving memories and street musicians begging for spare change surround me. I breathe in their music and let it be the soundtrack to the closing credits of my life. I raise my arms up to my side, reaching for the skies that surround me. And I step into the air. Tonya Fitzharris is a writer, reader, blogger, mediocre cook, photographer, runner, Florida native, and cat lover. She used to be a Middle School English Teacher, but now she's trying out the whole novel writing thing. She lives in New Jersey with her husband and her Belgian cat named Waffles. 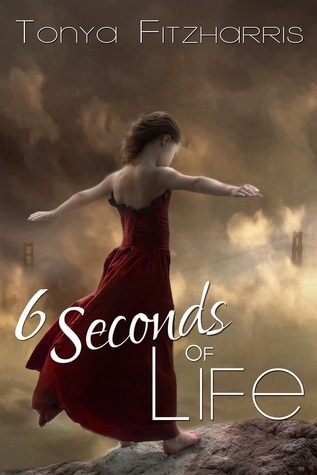 For more about 6 Seconds of Life check out these sites! Sounds like a really exciting read! I love that excerpt - it definitely makes me want to read more of teh story. Great cover and a great teaser!